NEW YORK — If he’s to have any hope of keeping his job, President Barack Obama needs to regain the love of young voters. But with 50 percent of Americans under 30 jobless or underemployed, the once cozy relationship is strained. For those not used to U.S.-style presidential campaigns, the appearance of a head of state on a late-night comedy show might seem a little odd — and Mr. Obama’s Republican critics pounced. But young people are a critical voting bloc and while the group favors Mr. Obama over the certain Republican nominee, Mitt Romney, Mr. Obama needs to win them by a large margin given Republicans’ advantage among older voters, white voters and male voters. The night that Mr. Romney was celebrating winning Republican primaries in five states and making the case that his campaign is one of hope for a better America, the president was pressing for a freeze on the interest rate charged on government student loans by trading lines with comedian Jimmy Fallon. The Roots, an R&B band jammed, as the young audience squealed. For the president, the issue could be a winning one as American college debt is expected to hit $1 trillion, more than credit card debt. This motivated angry students to demonstrate in New York on Wednesday. Students around the world have flexed their collective muscle when pushed and political leaders have taken note. In 2010, thousands of British university students violently took to the streets when plans to increase tuition where announced. The protests continued last year. Chilean student protests last year forced reforms then students took to the streets this week to protest the reforms not going far enough. 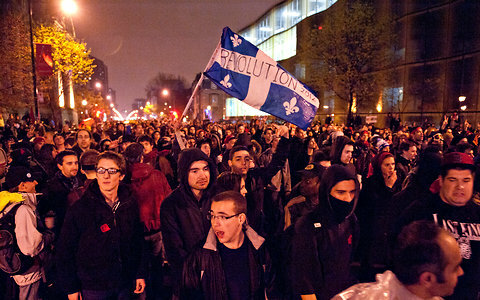 And this week protests by French-Canadian students over proposed tuition hikes turned violent in Montreal. The student movement, which has led a student strike for the last 11 weeks, could trigger a snap election in Quebec. Presidential candidates going on TV to court young voters isn’t new. But once elected part of being the commander-in-chief requires projecting an aura of strength. Though Mr. Obama’s appearance was a hit among its intended audience, selling himself going forward is not likely to be as easy as it was four years ago. A recent poll by Harvard University’s Institute of Politics found that only 20 percent of people between the ages of 18 and 29 believe the country is headed in the right direction. Four years ago, Mr. Obama fired up the enthusiasm in young voters. That enthusiasm is waning with the Harvard poll suggesting that only 43 percent would vote for him now. As a lawmaker he didn’t show up to vote on the student loan bill he’s now pushing Republican lawmakers in Congress to extend. Still his “jam session” only buttressed his cool factor to segments of America’s youth who already know that he can sing. At least he isn’t channeling rap stars Jay-Z and Kanye West the way French presidential aspirant, François Hollande, did to ratchet up his hip quotient. Maybe it worked, since Jean-Luc Mélenchon, the far-left leader and a youth favorite did less well than expected in Sunday’s first round of elections. Next week the Obama campaign will hold its first official re-election rallies with campus stops in Virginia and Ohio. Mr. Obama and his wife will reiterate that they only recently paid off their own student loans. “I didn’t just get a policy briefing on this. Michelle and I, we’ve been in your shoes,” the president has told students. Still Mr. Romney isn’t ceding the youth vote. He asked: “When you look at 50 percent of kids coming out college today can’t find a job or can’t find a job which is consistent with their skills, how in the world can you be supporting a president that has led to that kind of economy?” The businessman however did an about face and now supports the student loan proposal after seeming to not agree. The president’s pressing the issue appeared to work. Republican leaders announced they would vote for the interest rate freeze on Friday. It remains to be seen if it will be enough to push job seekers to the polls this fall. For more or to make a comment click here.